Step out of the city life by going to Falesia Beach and Cape St. Mary. 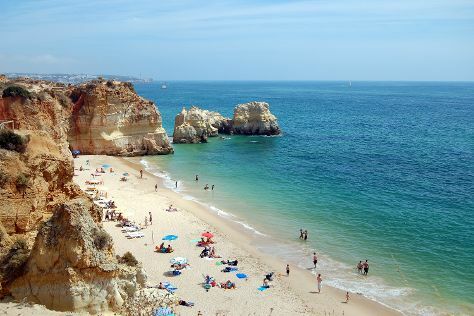 Explore the numerous day-trip ideas around Vilamoura: Praia Da Rocha (in Praia da Rocha), Carvoeiro (Praia da Marinha & Praia do Carvalho) and Alvor Boardwalk (in Alvor). It doesn't end there: tour the pleasant surroundings at Praia dos Olhos de Água and take in the waterfront activity at Vilamoura Marina. To find traveler tips, photos, more things to do, and tourist information, go to the Vilamoura trip itinerary maker. In September, daytime highs in Vilamoura are 30°C, while nighttime lows are 21°C.